Website redesign 2019 Powerful guide to know when it's due! Website redesign, have you ever thought about it? Websites are now the reference page for anyone looking to make any invests these days. As a result, everyone has a website. However, having a website and having a good website are two very different things. That is why today we give you the signs that should tell you that it is time to revamp your website with a new website design upgrade. The reason why you have a website is to turn visitors into customers. Therefore, the user experience should be a priority. Make sure that the content is easy to read and that the overall website redesign of the site is user-friendly and easy to navigate. Have thought about adding videos to your website to increase user experience? Other than being user-friendly, make sure that the website is mobile friendly as well. People nowadays browse more with their smartphones than on desktops. As a result, make sure that your site can be accessed on mobile phones as with desktops with your new website redesign. Sure when you created the website, the branding that you used was great, but things have changed. With that being said, make sure that the manner that you brand your website is a direct reflection of who you are as an individual or company. 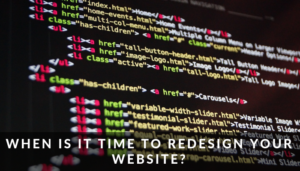 Times have changed, and so has the coding that is used to create websites. If you spend more time troubleshooting your site, then you need to upgrade it. By so doing, you open up more opportunities to be a better company or brand. The last, but most important reason why you should redesign your website is for ranking. The reason you have that website is that you can be found on the web. Therefore, if you do not rank, then the website needs to be redesigned. We can you help you with getting your website redesigned in Zimbabwe. Why not give us a call on +263 776 260 360 or email us to discuss your website redesign project whether you are in Harare or anywhere in Zimbabwe. Get a free no obligation estimate or contact us to discuss your exact requirements. We appreciate that your business is unique in its own right. Therefore, we will develop a website redesign plan and approach for you. Kindly fill the form below and we will reply you urgently with a custom pricing quotation. We are open from Monday to Friday 8 am to 5 pm.